Colorful Thai cushions directly from Thailand! Thai cushions can be unfolded and enable a marvelous way of relaxation due to the sewed on triangle and the lying area. Our Thai cushions are ideally suited for any kind of relaxation! Triangle cushions are the ideal companion all around well-being. 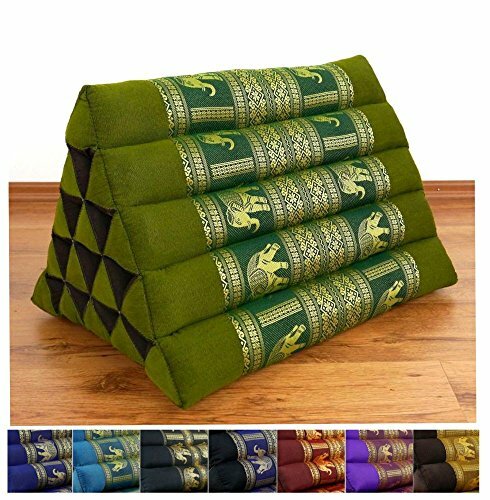 Thai cushions are extremely well suited for reading, watching TV, yoga, or for simple "relaxing"! Our Thai cushions are also suitable for outside areas, because we have the cushions firmly filled with kapok. Due to this special plant fiber, no cold from the ground comes through. The fiber has a pleasant insulating effect in the summer. Kapok is a pure vegetable product, which we use untreated and natural for the filling. Our cushions are handmade in selected family companies and only natural and sustainable materials are used. Our Thai cushions are filled with 100% kapok and have durable cotton covers made of pure cotton. Dimensions of the Thai cushion: 22x16x14 inches (LxWxH). Our Thai cushions are handmade in selected family companies and imported by us directly without intermediaries! LivAsia Thai cushions are filled with pure and untreated kapok! Material: Cover 100% Cotton; Filling 100% natural Kapok. If you have any questions about this product by LivAsia, contact us by completing and submitting the form below. If you are looking for a specif part number, please include it with your message. "THAISMILE" (DOUBLE) 2 x Magnific BIG ELEPHANT Thai Silk Decorative Throw Pillow Cases / Pillow Covers / Cushions, Size 16"x16"